Dalhousie is a place where you can find lush green valleys and towering mountains in their wildest and most magnificent aspects. Its natural beauty, invigorating air, warm sunshine and quiet surroundings are further enhanced by its open green valleys and dense forests. The quiet picturesque town of Dalhousie is interspersed with the colonial-era buildings, low roofed stalls and hotels. The pine-covered slopes are intersected with paths and treks; make this place an ideal honeymoon destination for romantic couples who want to make their honeymoon the most romantic and the most memorable one. The nearest Airports are Amritsar Airport -192 km from Dalhousie (approx. 5 hours drive) Jammu Airport -190 km from Dalhousie (approx. 5 hours drive) Gaggal Airport (in Kangra -135 km from Dalhousie). The nearest railway station is Pathankot (Punjab) around 80 km from Dalhousie. You can drive from Pathankot to Dalhousie and it takes 2-3 hours by car and around 5 hours by bus. You can also rent taxis near the railway station. Chandigarh (353 km) and Delhi (563 km) are the nearest cities to Dalhousie. You can take buses, taxis and tourist vehicles to Dalhousie from here. Being an ideal honeymoon destination, Dalhousie is well equipped with excellent accommodation options ranging from luxury and five star hotels to small budget hotels and tourist lodges. The best time to visit Dalhousie is from mid-May to mid-October. 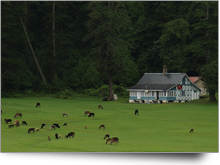 Kalatop : situated 10 Kms from Dalhousie and is famous for the Diankund Peak. Khajiar : is 23 Kms from Dalhousie by road and 13 km from Kalatop. This place is also referred to as the mini Switzerland of India. Dalhousie hills: Bakrota hill, Terah hill, Moti Tibba hill, Portreyn, and Kathalag hill. Dalhousie has a number of old churches. The most famous are the St. Patrick's Church, St. John's Church and the St. Francis' Church.